The Tour Striker 52 Wedge was designed to help all players improve their impact position on chips, pitches, punches and full wedge shots. This versatile practice club will help you develop the correct swing and impact to compress and control the myriad of distances required to be a successful wedge player. The Tour Striker 52 Wedge works for players of all swing speeds. Unlike a traditional golf club, the radical Tour Striker 56 Wedge has little clubface below the "sweet spot" and gives you the feedback to train you to make a descending strike with forward lean, the fundamentals needed for spin and precise control. The Tour Striker 52 Wedge has been designed to intuitively teach golfers the correct way to deliver the "sweet spot" of the wedge to the ball so you can control your wedge shots, just like the Tour players. 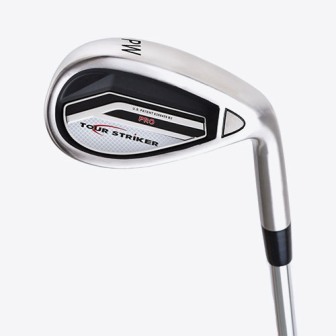 The Tour Striker 56 Wedge works for all golfer’s no matter your swing style or shape. Practicing with the Tour Striker 56 Wedge will quickly improve your wedge play and teach you to deliver the wedge with tour quality impact for successful scoring shots. 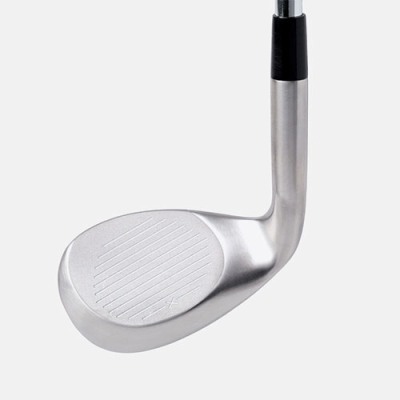 This club is NOT designed to teach “lob” or “flop” shots. The Tour Striker 52 Wedge will help you develop the swing and impact required for trajectory and spin control for precision wedge play. You will quickly learn how to get the SWEET SPOT of the Tour Striker 52 Wedge below the CENTER OF GRAVITY of the ball, by naturally applying forward shaft lean during impact. Transferring the feel learned from practicing with the Tour Striker 56 Wedge to your traditional short clubs will occur automatically.